The exact site is uncertain and there are no major remains – possibly. A residence was set up in Dromore following the Provincial Chapter of 1637 in order to relieve pressure on the friars of Downpatrick. Despite evidence that they abandoned the area about 1717, the Friars continued to work there. They set up a school at Drumnaquoile, which was eventually handed over to lay teachers. Only one priest was still alive in 1796, having spent a life-time serving the local-chapel. He died before 1800. 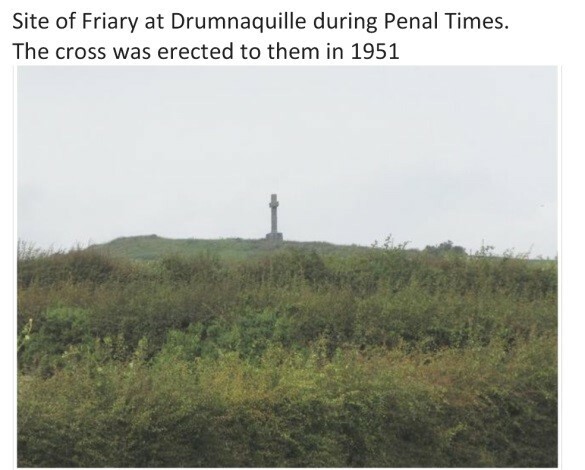 A cross – GPS 54.3222932 -5.928198 – was erected 1951 marking the site of the Drumnaquoile Friary in Penal Times.